When I was researching Lite N Easy, I did not find much in the way of photos of the food, so I thought I would blog my experience with it quite comprehensively with plenty of photos so that future people researching Lite N Easy could tell at a glance if it would suit them or not..
Up front I should say – nobody from Lite N Easy asked me to do this, nor did they know I was doing it, nor did they pay me to do it. I paid them for the food they sent me. The majority of the meals simply require microwaving and eating. The hardest of the meals I prepared required poaching an egg and then putting together eggs benedict. There is some grilling (eg putting tomato on toasted bread then cheese on top, then putting it under the grill) and quite a bit of toasting. 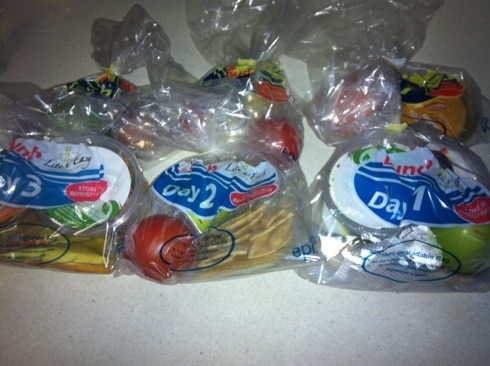 The majority of the meals are in their own plastic bag labelled by day. Keep a copy of the menu on the fridge so you can know when you need to find a frozen item (frozen items appear in red on the menu plan) – makes it easier to know what you are looking for in the freezer. While breakfast and lunch are kinda set in stone, you do get to pick which dinner you eat on what day. This means if you end up going out to dinner you can just keep that extra meal for another time. There is at least one serve of fruit a day and sometimes more. This is good to get back into the habit of regularly eating fruit and also to get into eating fruits I might not have chosen. I remember seeing one of the ads where someone was talking about how it felt good to eat the food because it felt healthy (something like that anyway) and it does feel good. You know if you only eat the food you are provided, you are going to be at a certain amount of calories per day. Because the food is delivered to you, you do not need to go to the supermarket, unless you are shopping for someone else in the house. There are no potato chips in my house at the moment, which is extremely unusual for me. The other half does not like them or eat them unless I put a bowl of them in front of his face. They are my go to snack food. I want to buy them, of course I do. I know I could buy them and weigh them and make them into calorie counted snacks. But I have found other things to eat, and I am not hungry between meals & snacks, so there is no need. There is chocolate in the fridge and plenty of it – that is not something that tempts me much. In fact I just cooked a couple of batches of brownies and I had a teeny tiny slice to try it and see what it tastes like – the rest is going to work. Now that I am used to eating smaller portions I would find it difficult to go back to the larger portions I was eating. I am not the biggest fan of bread. I thought it was because it usually goes mouldy too fast for me to eat it but once you take away the going mouldy issue I find it makes me feel bloated and blah. I don’t mind a wrap, I don’t mind the occasional toast or muffin, but every single day seems a little too much bread for me. I would love to try a gluten free diet for a couple of weeks and see if I feel better at the end of it. However Lite N Easy does not have a gluten free option. I’d love to try dairy free for a couple of weeks and see if I feel better, too. While I like chicken and fish myself and very occasional red meat, I can see that a vegetarian option would be useful for people. Paleo is a diet which is kinda taking the world by storm and as with gluten free I would love to try it but I don’t have the organisational skills to put that together. I’ve been inspired by this blog – Naturally Minimalist and once I have a bit more time on my hands I would like to try the Whole 30. I think Lite N Easy are missing a trick here. They sell a few different extras like soups and mini meals and desserts, but there is no option to choose extra snacks. I’d happily buy the spicy fruit cookies and some of the other snacks to substitute in when I don’t like the provided snack. I do miss icecream and I think I will miss it even more during summer. I’ll be looking at low calorie options for icecream over the next few weeks and will keep you up to date on what I find. I have an icecream maker and I like to make my own icecream with coconut milk/cream, espresso coffee shots or chocolate syrup. It is a bit difficult to estimate the calories on that, though. I usually have very small servings of it so I don’t think it would impact too hugely. I am lucky because I have someone in my workplace who is following the plan and we can talk about the food. This usually consists of “Did you try X? I LOVED IT” type discussions, or “Did you order popular or optional for lunch today?” and we often compare what the other person has to eat if they chose the other option. I am a bit disappointed that they don’t have forums where people can share their thoughts, progress, photos of the food, etc. That certainly would have made the decision on trying it a lot easier for me. It would be good to have a place where L&E peeps can go to chat with each other. All of the above things are said not to criticise but maybe if someone from Lite N Easy is reading this, they could think about adding a Gluten Free option, or maybe the occasional ice-cream! If you have been reading all along you know that the reason I did Lite N Easy was not for weight loss (though that would be a nice side effect) but to get into the habit of eating regularly again. Because of the shift work and not feeling especially hungry when I would get up in the morning, I would not eat breakfast. I would not be organised enough to create any kind of lunch. If I got hungry in the afternoon I might eat chocolate biscuits, or something equally junky. I would eat a huge dinner *HUGE* because by then I would be hungry, and then I would snack until bedtime. I was having trouble going to sleep but when I did go to sleep I would want to stay asleep as long as possible. I can tell that I have lost weight – how much I do not know, because my scales are EPIC FAIL and I need to get new ones – but my clothes are fitting better and parts of me have been re-scuplted and vanishing. Could it be that good nutrition is the key to everything? Here it is only day 3, and already i am sleeping better, feeling overall much better, and my mind is a lot more quiet. The answer to this is up to you. I certainly have plenty of good things to say about it – and no bad things at this stage. You can also check the Frequently Asked Questions at Lite N Easy. If you have a question make sure to ask it below and if I have an answer I’ll reply to your comment, and update this post with the answer too. The 1200 Calorie Delivery – It Arrived! A quick word about cereal and fruit. Post your question or comment below. They definitely need a forum! It would really be to their benefit. I wouldn’t have thought of the extra snacks, but that’s a great idea, too. I really like all the fruit, but I have also found it a bit bread-heavy. So nice to meet someone else who is on it! I’ve enjoyed your blog, Snoskred. I have just had my first Lite N Easy breakfast and your blog answered the question I had googled – what to do with my frozen bread roll for lunch. Thank you; I now know to microwave it for 30 seconds. I was previously a Jenny Craig girl and found it very successful and enjoyable – reached goal and maintained for several years. It’s just so restrictive and I like the LNE option of providing your own breakfasts and lunches, although I’m beginning with the full program. I would prefer to buy my own fresh salad, fruit and bread; we have an amazing artisan bakery nearby. I think I will be making some substitutions. I look forward to trying the dinners. All the best.